Wheat is the main host for the wheat stripe rust pathogen (Puccinia striiformis f. sp. 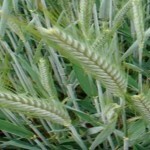 tritici). Sometimes wheat is infected by the barley stripe rust pathogen (P. striiformis f. sp. hordei), but usually does not suffer much damage. Barley is the main host for the barley stripe rust pathogen (P. striiformis f. sp. hordei). Sometimes barley is infected by the wheat stripe rust pathogen (P. striiformis f. sp. tritici). 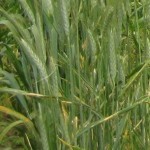 Triticale is a man-made crop by crossing wheat and rye. It can be infected by the wheat stripe rust pathogen (P. striiformis f. sp. tritici). 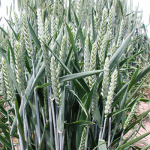 Most currently grown triticale cultivars are resistant to stripe rust, but some can be highly susceptible. Rye is the main host for the rye stripe rust pathogen (P. striiformis f. sp. secalis). 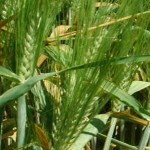 Rye has been found to be infected by typical races of P. striiformis f. sp. 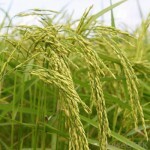 tritici. Oats are not a host for P. striiformis. On rare occasions, P. striiformis f. sp. 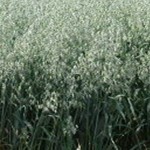 tritici can infect oats, producing resistant reactions without urediniospores. Rice is not a host for P. striiformis and any other Puccinia spp. Studies have been done to determine the non-host resistance of rice to P. striiformis and other Puccinia spp.